If money printing helps everybody, then why does everybody not always have zero interest rates, then everybody would be rich and you keep on printing rich. So lets just print money. It doesnt add up. First, nobody could have a more negative view of the Federal Reserve than I. It is run by a disastrous group of academics, who have no clue about what is happening in the real world. They believe money-printing can create jobs. They are going to bankrupt the world. Mr. Bernanke said the intention of QE3, which then turned into QE4, was to lower long-term bond yields. As it happened, yields on Treasury notes and bonds bottomed on July 25, 2012, and have been rising since. The policy was a failure. China has grown extremely competitive in the quality of its earth-moving and construction machines. What they produce is better than what Deere and Caterpillar produce. The problem in America is that you have a lot of Facebook geniuses who sit around all day looking at their own pictures. They don't have competitive jobs. I met a diver in Shanghai the other day who repairs platforms and pipelines. He makes $180,000 a year and works half-time. The point is, there are lots of jobs that would pay well, but not many Americans are qualified to do them. Pretend you are the leader of China's army. The Americans are enlarging their bases in Australia, trying to stir up trouble in the Philippines and Vietnam, and lifting an embargo against Burma. America also has a defense pact with Japan. The Chinese depend on oil, copper, and iron, all imported commodities. What would you do to protect your border? The tensions in Asia are real and rising, and could cause a market panic, just like the financial crisis Felix discussed. The Chinese have decided to shrink their government's share of the economy and make markets freer. Everywhere in the industrialized world, you find the opposite. China has a dark side, too. In the U.S., someone can be highly critical of the government and stay alive. If you write something negative about the leadership in China, you can be put in jail for a long time. There is only one Nobel Peace Prize winner behind bars -- Liu Xiaobo, in China. But I like some airline-servicing companies based in Singapore, including SATS, in the catering business, and SIA Engineering, which overhauls aircraft. They have subsidiaries in many Asian countries. The stocks yield around 4%. They aren't supercheap, and the Asian markets generally aren't cheap enough for me. But longer term, if you want to park money in Asia, both companies will do well. To clarify a point about the size of the U.S. economy and its importance in the world, China imported 12% of global metals consumed in 2000. Now it imports up to 47% a year. China's growth has a major impact on emerging economies. The U.S. has no impact because it is a service economy. China has gone from sending less than a million travelers overseas in the mid-1980s to 100 million now. You hardly see American tourists in Asia any more. We have to distinguish between the Financial economy, the financial sector and the economy of the well to do people that benefit from rising assets, painting, art, wine and high end properties in the Hampton s and West 15th in New York and the average typical household or working class people. The fed's policies have led to a lot of problems around the world. They are partly responsible for energy prices are where they are, from $10 from 1999 to now around $100 a barrel. Food prices are up. For the poor people this has an impact. Some people in the Lower income groups spend say 30 percent of their income on transportation, gasoline, electricity. And the problem is people like Bill Deblasio say, 'you know whats the problem, all these rich guys... because of these rich guys you are poor, they take advantage of you so lets go and tax them'. Its interesting that despite all the money printing bond yields didn't go down, they bottomed out on July 25th 2012 at 1.43 % of the 10 year. We are now 2.85 %. We are up substantially. This hasnt had an impact on stocks yet. Infact it pushed money into the stock market out of the bond market. But if the 10 year goes to 3 and half to 4 percent and the 30 year goes to close to 5 percent, the mortgage rates go 6 percent, that will hit the economy very hard. I was just telling my colleagues at the Barron's Round table that if I would say about China, what I'm saying about America, they [Chinese] wouldn't let me in the country. But here in United States they hug me, they say 'Welcome to the United States'. It[stock market bubble] can burst any day. We are very stretched, sentiment figures are very very bullish, everybody is bullish. The reality is they are bullish because they think the economy will accelerate to the upside. But my view is very different, the global economy is largely emerging economies nowadays, and they are slowing down. There is no growth at the moment in emerging economies, there is no growth in local economies. So I feel that the valuations are high, the corporate profits have been boosted largely by the fall in interest rates. I think Facebook is a to a large extent a fad and people they go on Facebook. For most people what people do is, they put a picture on, and the only people that watch these pictures are themselves. They all want to be stars. Its a very distracting type of occupation. I cant imagine that this would have a lot of value. The question is how much use it is. [Instead] I would rather own, I don't own it because its very highly priced, a company like Alibaba, Amazon, Google than Facebook personally. That is my view. 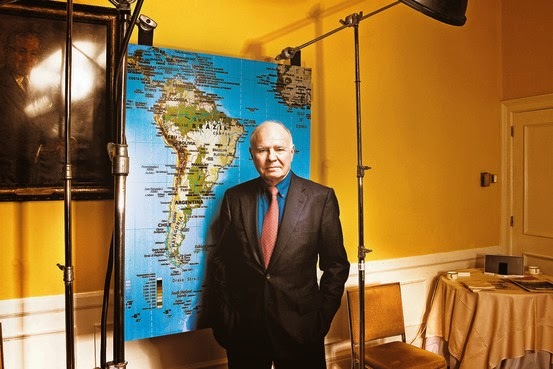 Watch Marc Faber talk to Trish Regan on January 14, 2014. I do not believe that the central banks around the world will ever, and I repeat ever, reduce their balance sheets. They have gone the path of money printing and once you choose that path, you are in it and you have to print more money. According to a Gallup Poll, only 52 percent of Americans own directly or indirectly stocks. Of those 5 percent own 72 percent of financial assets. In other words rising stock prices have no impact on majority of Americans. When I look at all the failed attempts to create a fair and just society, I am inclined to think that giving away some of the fruits of our labor and good fortunes voluntarily by helping people around us - and through contributions to charities that actually make a difference - may not be the optimal way of redistributing wealth, but it is probably much more preferable to the others. Moreover, I cannot imagine any circumstance under which even the worst charity would commit more irregularities, waste more money and misuse more funds (for criminal purposes as well) than what governments do on a regular basis. As Irving Fisher observed: “If all prices and incomes rose equally, no harm would be done to anyone. But the rise is not equal. Many lose and some gain”. Throughout history poverty existed. I fully agree with David Hume who opined that, “Every person, if possible, ought to enjoy the fruits of his labour, in a full possession of all necessaries, and many of the conveniences of life. Such an equality is most suitable to human nature, and diminishes much less from the happiness of the rich, than it adds to that of the poor. Socialism and communism were horrible failures; redistribution through taxes and subsidies have also largely been unsuccessful at eradicating poverty; the redistribution of wealth through revolutions were always a complete disaster; and creating wealth for every person through money printing, which creates inflation of some consumer prices or assets has had the exactly opposite result.